Financially stressed workers are less satisfied with the roles and pay and are more likely to go search for greener pastures affecting the turnover of the company. Following the euphoria of December and consequent heightened consumer activity during the festive period, January has brought many an elated individual back to mother earth with a thud. With January in full swing and the rand in an all-time slump, the increase in the Repo Rate has become an added worry. The effect of an increase in the Repo Rate increases the burden on consumers and bond holders feel the strain even more. Back to earth: Bonuses and out of the ordinary December big pay cheques put many consumers in unreal world of self-sufficiency, only to be jolted back to reality, what with the slumped rand playing havoc, and in real terms, decreasing disposable incomes. The bond holders are often what we see when we look in the mirror or our colleagues’ faces within the workplace. What impact does the prevailing economic environment really have on employee productivity within the workplace? It goes without saying that generally bulging pockets tend to make many happy and those with holes in their socks are a glum lot. Would it follow that a financially destitute employee is an unproductive individual? The economic downturn as well as the increased costs of daily living are proving to have an adverse impact on businesses more so the Small, Medium and Micro-sized Enterprises who do not really have the luxury to pull their resources together or a diverse portfolio. Consequently the number of indebted employees have swelled and this is seemingly resulting in poor performance and lost time. An increase in the cost of living without an increase in income requires us to manage our resources smarter. 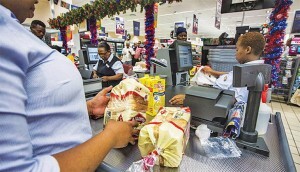 South Africans have to constantly contend with increases for petrol, electricity, food and other essential items. The recent drought across the country increases farmers’ input costs, which results in increased food prices. It seems as if these increases have already begun to affect the lower earning bracket including vendors of fruit and vegetable. The latest exchange rate – rand to the dollar – is at an ascended 16.78 at the time of writing. As the dollar strengthens, our cost of living increases but when the dollar plummets our cost of living remains. This cycle compels one to enter into unwanted debt. A study conducted in 2015 by the World Bank ranked South Africa as the world’s top borrower. 86% of South Africans took a loan between 2013 and 2014. It would be ignorant to underestimate the effects these financial constraints have on an individual and their work. Healthcare. Overall, healthcare is more expensive in South Africa. Employers contribute far less to its overall cost and people make far less in this country than in America, which makes healthcare even more expensive from a cost of living perspective. Transportation, South Africans are one of the most car obsessed individuals, willing to pay 50 – 60% of their annual earnings on a rapidly depreciating asset. Cars are not just a method of transportation but a status symbol to many. While for a New Yorker, subways are only a logical means of transport though the advantage also lies in the sophisticated transport system that has tentacles throughout the city. Having exorbitant financial responsibilities such as these certainly places a lot of strain on individuals. Most people experience difficulty at some point in their lives. Days available: 70% of unscheduled absenteeism is related to stress-related illnesses of which one of the causes is financial distress. Engagement: On average a financially-stressed employee will spend 20 hours a month dealing with financial issues at work. The loss in productivity has significant financial implications to the organisation. Fatigue: “Present-eeism” where an employee is physically present but mentally absent due to distractions linked to financial concerns or loss of sleep from worrying. Six hours of productivity is stolen a month per employee. Alertness: About 70% of workplace accidents are stress-related, one of the causes being of a financial nature, costing the company a considerable amount of money. Commitment: Financially stressed workers are less satisfied with the roles and pay and are more likely to go searching for greener pastures affecting the turnover of the company. Ethics: Financially stressed workers are more tempted to steal from their employer and a good percentage has been caught doing so. Some of the costs raised through theft cases are tightened security/policies, Human Resources, Legal expenses and employee replacement. Financial worries do not go away just because someone is at work. How can we change this culture? How can we improve workplace productivity despite the financial difficulty individuals are swallowed into? Educating employees about how to improve their personal finances is one of the most effective ways to reduce overall stress, which automatically accelerates productivity. Organisations should incorporate robust, on-going financial education as part of the company’s wellness programme. These programmes should include workshops on budgeting, reducing expenses, managing credit card debt and maintaining debt-to-income ratios. The cost of providing personal financial education is minimal compared to the cost of having financially stressed out employees. Employees should also take the onus and have a financial plan, be motivated to save, make investments and steer towards financial security.